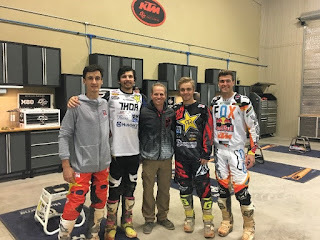 CLERMONT, Florida – Aldon Baker, one of the most well-known and successful trainers within the Supercross community, is currently training several of the sport’s top riders at his facility, which is located in the Clermont area. In an interview at this training facility, Baker gave a glimpse into what it is actually like to train these professional riders. When I asked Baker about his journey to becoming a trainer in his field, he explained that he initially trained individuals, specifically bicyclists, using cardio and strength conditioning techniques. Baker’s cycling career brought him from his home in South Africa to America, and once in the United States, the brand Oakley steered him towards working with motorcycles. Baker also explained that his elite training program did not come together quickly. According to the celebrity trainer, “The [conditioning and training] developed over time… It took 17 years to create the full training package”. He utilized his training from his own professional career in cycling and was able to accomplish a great feat, as he is now both well-known and respected throughout his profession. the airport in such close proximity, the location is perfect for the riders. Aldon is currently training several of Supercross’ most elite riders, many of whom are currently claiming the top spots in the Monster Energy AMA Supercross Championship. These riders include stars such as Ryan Dungey, Marvin Musquin, Zach Osborne, and Jason Anderson. A press release from Racer X Online in 2014 explains that Baker has also been the “athletic trainer to champions past and present like Ricky Carmichael, James Stewart, Ryan Villopoto, Ken Roczen, Adam Cianciarulo, and more…” (“First Look…”). Ryan Dungey, pictured above on the far right, is currently runner-up in the point standings for the 450’s in the Monster Energy AMA Supercross Championship; while Marvin Musquin, pictured on the far left, is following close behind in 3rd position. For those who aren’t as familiar with Supercross as other readers may be, this sport can be defined as “a motorcycle race held in a stadium on a dirt track having hairpin turns and high jumps”. To succeed in Supercross, riders must consistently stay on top of their game, train as much as possible, and be committed to the sport itself. Consider the fact that the Supercross races are widely televised and watched by many from across the U.S. and the world. These races attract “nearly one million fans in live attendance,” as well as engage with “10 million viewers around the globe weekly”. Once you know that, it is pretty incredible to think that some of the most celebrated riders live and train right here in Clermont. These top athletes have thousands of followers across their social media accounts. However, if you were to run into one of them in Starbucks or Wawa, would you recognize them? For those who follow Supercross or are involved personally in the sport, the answer would probably be yes. While this may be true, for the vast majority of those living in the area, the chances are that these superstar riders would go undetected. Lastly, I thought it was important to ask Baker about the types of riders he accepts to train at his facility. The renowned trainer revealed that, when he chooses who to work with, he looks for “an individual with a good work ethic, consistency, talent, and ability". Baker went on to explain that his program is extremely difficult, and in order to succeed in both the training and competitions, riders must be able to eliminate any distractions and be motivated enough to give the sport their all. Whether you have heard of Supercross before or this is your first time learning about the sport, I definitely encourage you to watch one of the races on television or attend one, if possible. The riders work exceptionally hard to compete well in the races, and so much more goes into the process than just simply getting on a motorcycle. Trainers, such as Aldon Baker, push the athletes to do their best every single day, and hopefully, you were able to get a glimpse into the lives of these hidden Supercross stars, many of whom live right here in Clermont. Although the championship is currently coming to a close, there are still a few more opportunities to watch these races in the following weeks. You can tune-in to the races on FS1, FS2, ESPN, FOX Sports GO, and more. For more information regarding the Monster Energy AMA Supercross Championship or how to get involved, check out the Supercross Live website here: http://www.supercrosslive.com/.